While director D.W. Griffith‘s Birth of a Nation (1915) utilized revolutionary film techniques and influenced audiences nationwide, it is widely frowned upon today (and rightly so) for its grotesque racism. Lasting over three hours, the silent epic covers many personal, local, and national issues. Griffith wanted the film to viewed as not only historically accurate, but morally true as well. Not simply a reflection of the culture, he hoped the film would help shape American culture (and it did, unfortunately). The fact that the movie is a silent black and white film (although forced upon them because of technology) reflects Griffith’s view of America in more than one way. He attempts “to show the dark side of wrong, that we may illuminate the bright side of virtue,” as the opening slides read. Absolute in his vicious racism, for Griffith, “the dark side of wrong” refers almost solely to African-Americans, whereas “the bright side of virtue” universally refers to white Americans – showing morality in ‘black and white’ terms, metaphorically and literally. While the various white characters are depicted both positively and negatively, blacks are universally shown in an extremely negative light. The Ku Klux Klan, which is especially glorified in the film, is depicted heroically in their all-white costumes, again emphasizing color differences. In the opening slides, Griffith also references the Bible and Shakespeare, two staples of our culture, both then and now. Hoping to produce the film equivalent of those monumental works, Griffith hoped to use “the motion picture not only as a means of amusement, but as a moral and educational force,” as he said in an interview, especially because film was “the Laboring Man’s University.” The “Laboring Man” that Griffith hoped to influence directly contrasts with the film’s depiction of blacks, who are brutally depicted as lazy, stupid, violent, and immoral. The film is also hugely influential for its technical and aesthetic cinematic achievements and some of the positive values it promoted (which, of course, by no means cancel out the film’s overwhelming prejudice). 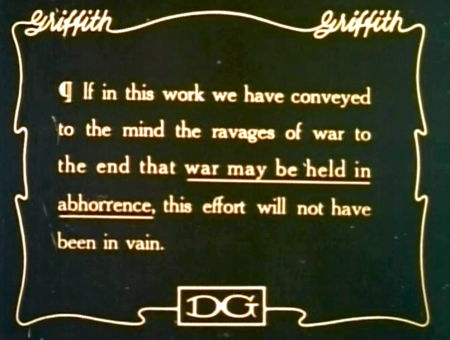 For example, toward the beginning of the film, a peace-promoting text slide reads: “If in this work we have conveyed to the mind the ravages of war to the end that war may be held in abhorrence, this effort will not have been in vain.” This reflects Americans’ desire for peace, especially at that time. Throughout the film, Griffith emphasizes the nation’s common humanity (but only for whites), the terror and ineffectiveness of war, a respect for Abraham Lincoln and Daniel Webster, and a respect for religion (with Biblical allusions throughout) – ideas that (for good or for bad) are still supported by many Americans to this day. 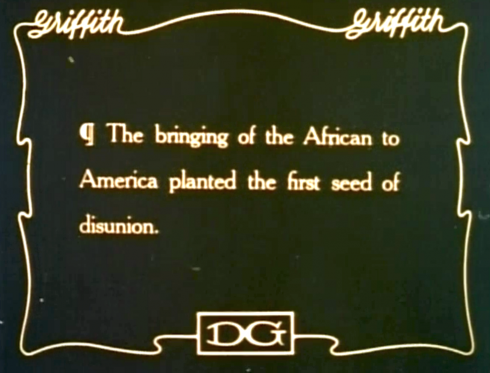 Regardless of its positive contributions, the previously mentioned early text scenes act as a preview and summary of the brutally racist film: D.W. Griffith’s Birth of a Nation aimed to be a powerful myth in American civil religion through its attempt to unite white Americans of all regions by mercilessly scapegoating African-Americans. Still, The Birth of a Nation has its admirers. Until Gone with the Wind in 1939, it was the highest grossing film of all-time. The film is preserved in the National Film Registry after the U.S. Library of Congress deemed it “culturally, historically, or aesthetically significant” in 1992. Even famed critic Roger Ebert wrote, “The Birth of a Nation is not a bad film because it argues for evil. It is a great film that argues for evil.” In 1998, the American Film Institute even recognized it as the 44th best American film of all-time. In the end, there are no terrific techniques that can redeem what it teaches, no industry innovations that can cover up its ignorant racism. This entry was posted in History and tagged griffith, hate, hatred, kkk, ku klux klan, mac, mac mccann, mac mccann tx, macmccann, macmccanntx, mccann, movie, movie review, movies, nation, of, prejudice, president wilson, president woodrow wilson, production, race, racism, review, the birth of a nation, tx, wilson, woodrow, woodrow wilson by Mac McCann. Bookmark the permalink.